Twino is a well known P2P investment site based in Latvia, with lending subsidiaries in several countries. In the last few years it has regularly won awards. Its management regularly appear in various Fintech conferences and forums. Back in 2017 we raised some concerns about Twino. There was not a lot of information or data available but we had a sense that things may not be going as well for the company as all their PR campaigns and marketing materials would suggest. Twino has just released their audited consolidated financial results for 2017, and also the parent company results (i.e excluding the results of the subsidiaries) for the 9 months to September 2018. We think it shows that some of our previous concerns were well founded. In our view, the company faces considerable challenges that have not been put in the spotlight up to now. P2P sites often publish statistics to show potential investors how well they are doing and what success they are having. Volume is an important metric investors keep track of because the larger the platform, the more viable it becomes, and the less likelihood it will go out of business. The chart above certainly looks good. It shows very stable and consistent growth. However it is showing cumulative investments which is almost totally irrelevant. Why? Because what’s important is the total amount invested on a platform at any time, rather than cumulative investments. 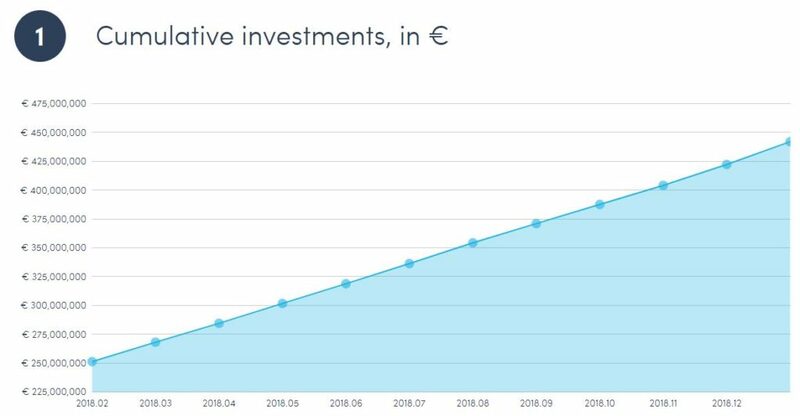 In 2018, Twino has been actually going backwards on this more important metric, with loans funded by P2P investors falling from €27.7m to €23.6m. So how can Twino publish a chart showing €450m of investments? Most of its loans are very short term – 30 days or so. Every time these loans are repaid and reinvested, it results in the ‘cumulative investment’ measure going up. The chart above shows the loan status of Twino loans, with 76.4% ‘current’ and 19.4% delayed (less than 30 days in arrears). Only 4.2% of loans are shown to be defaulted, which seems like a satisfactory result. This may be true of the loans currently held by the Twino parent company but we feel it does not really give the full picture. Defaulted loans are returned to the Twino subsidiary companies. Overall, the Twino group reported a non-performing loan ratio in December 2017 of 41%, after including all the bad loans sent back to the subsidiary. 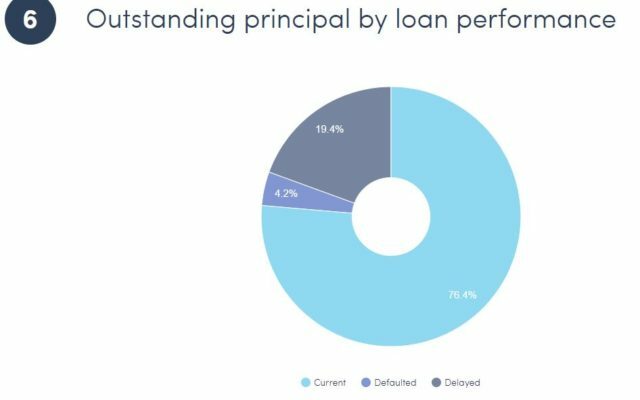 This will not be clear to many people viewing this chart, and in our view the chart misrepresents the actual credit quality of loans sold on the Twino platform, as the extent of defaulted loans is 10 times higher than shown in the chart. It means that investors are significantly more reliant on the ‘buyback guarantees’ than the chart suggests. What next for Twino? What lessons are there for P2P investors? Since raising our concerns in 2017 we have not provided much coverage of Twino, even though it is one of the larger and more prominent European P2P sites. This is because the financial information available was very old, and the statistics published on their website were not very useful. We felt it best to wait until more information was made available. Now the new financial reports are available, we encourage any existing Twino investors to read them carefully, and consider the points raised above. Yes, Twino has a strong brand, is well perceived by many investors, and has been taking actions to address its issues. It is more than possible that Twino will turn the corner and find a way to get back on track. However, there are also reasons for concern, as outlined by its auditors BDO. The solvency of Twino is important because the loans they are selling to investors are unsecured and in many cases will need to be bought back by Twino under their buyback guarantee following a borrower default. We will have a better understanding of the situation once the consolidated results for 2018 are released. Hopefully these will not be significantly delayed, as the 2017 ones were. It seems that many of the issues that Twino has run into relate to starting many new lending businesses in different markets which they may have lacked sufficient experience or local knowledge. That’s why we can be sceptical of some startup lenders that appear on the Mintos platform. It generally takes at least 3 years of lending to become confident in the underwriting performance of a new lender. Where possible it is best to invest in loans originated by companies who can demonstrate a good lending track record, with knowledge of the local market. I have been waiting for this update from you for sometime. It would be reat if you expand your review to other platforms like Bondora, Grupeer, Viventor, fastinvest, easy invest and crowdestate.